1/4 cup or 1/2 cup of lavender(depending how strong of a scent you want). Measure out 1-2 cups of rice and 1/4 cup or 1/2 cup of lavender flowers. You can find dried lavender bud flowers on Amazon. I like to use Doterra's Lavender Essential Oil. 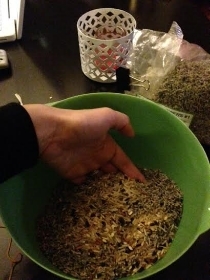 Mix the lavender flowers, rice, and oil together with your hands. This is a great sensory experience for kids! 5. You're done! Time to rest your eyes! Have your child use the eye pillow before bed or before a resting period such as a nap, Savasana, or deep relaxation to help keep their eyes closed. Breath in the sweet, calming smell of lavender to get into a deep relaxed state. Enjoy and have fun making this with your child! Share how it went with comments and pictures in the comments section below!